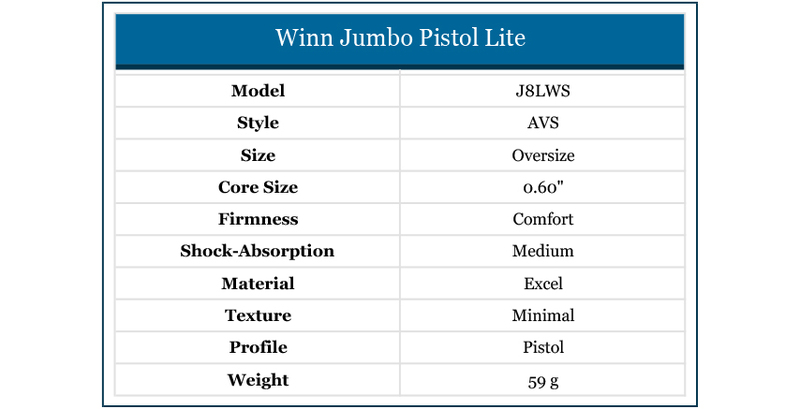 https://www.golfdiscount.com/winn-jumbolite-pistol-putter-grip?___store=default 1991 Winn Jumbo Pistol Lite Putter Grip https://media.golfdiscount.com/catalog/product/w/i/winn-jumbo-pistol-lite_grey-red-stone.jpg 16.99 16.9900 USD OutOfStock /Accessories This soft, tacky jumbo grip not only looks and feels great, but also incorporates WinnLite Technology to give it the weight of a standard grip. This lighter weight greatly enhances clubhead feel while providing stability during the putting stroke as well. This soft, tacky jumbo grip not only looks and feels great, but also incorporates WinnLite Technology to give it the weight of a standard grip. This lighter weight greatly enhances clubhead feel while providing stability during the putting stroke as well.